These gentle fascia stretches are not at all like a yoga stretch that you are instructed to hold. Our goal is to engage the fascia and connective tissues and to release and melt away the tension. The feeling of this type of stretch is more like a yawn. Targeting fascia doesn’t feel at all like targeting muscle, you learn to stretch and use your fascia and connective tissues by focusing on gently stretching the skin and other connective tissues that are located just under the skin layer. As the skin stretches and expands like a balloon, so do all the muscles and tissues below it. The practitioner will, with practice, eventually feel like “a balloon person” while doing Tai Chi! A more effective way to target fascia: The video below is a warm-up exercise we use in class daily for this purpose. Then, after the warm-up, we continue working the fascia by doing our Tai Chi Forms and various qigong exercises. We know that moving in this way hydrates the bones and tissues and gets the bodily fluids moving, thereby preventing dehydration and the breaking down of bone and tissues that cause us to become stiff and brittle as we age. We are working to open, hydrate, and lubricate the joints, ligaments, and vertebrae by gently stretching and making more elastic the veins, arteries, nerve tissues, and other connective tissues. The art of Tai Chi Chuan has been developing the fascia as a source of power in this way for hundreds of years. So, this is not a new concept at all but ancient in its origins. Our goal is to relax the nervous system, open the meridians, stretch fascia and skin, and sink and release the muscle and bones in order to gain access to and develop these powerful fascial lines. “Chi” and fluids (QiXue) circulation is just one method we use in learning how to sink and pull fluids up through the body to create power. This kind of movement is like a kinetic chain of energy and creates whole body power. 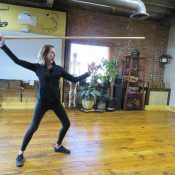 About the pictures below using the staff and spear: Every time we hold the spear one way, our bodies stretch a certain way to power the body. When we hold the spear in another posture, our body seems to organize itself by stretching in a different way. We are not using muscle alone to achieve this, but we have worked for many years now to develop our fascial lines to gain whole body power. Developing the body the Tai Chi way leads us to more skills, benefits, and abilities. The 8 Energies of Tai Chi, Fajin, increases power for both healing and martial arts. Once we can move past this elementary phase of stretching the fascia and connective tissue, and releasing the muscles and bones, then the next step is to very specifically develop the fascia and connective tissue into what our school refers to as “Power Lines” (Jin – power and Luo – channel). 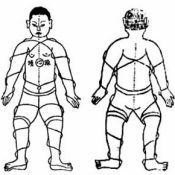 These elastic, whole body lines of power allow the Tai Chi student of any age to perform incredible martial feats; even a small woman can gain the upper hand in a conflict by utilizing this type of training. This is because in Tai Chi we don’t rely on muscle strength alone; in fact, it’s the fascia and tendons that create the majority of power that we use. Of course there are many great ways to develop health and power in your body, Tai Chi is just one of those ways. We achieve this by adhering strictly to the 13 Principles of Yang Cheng Fu. It is important to note that different lineages of Tai Chi all develop the body in somewhat different ways, but with similarities, all using their own set of Tai Chi principles and techniques unique to that particular lineage. 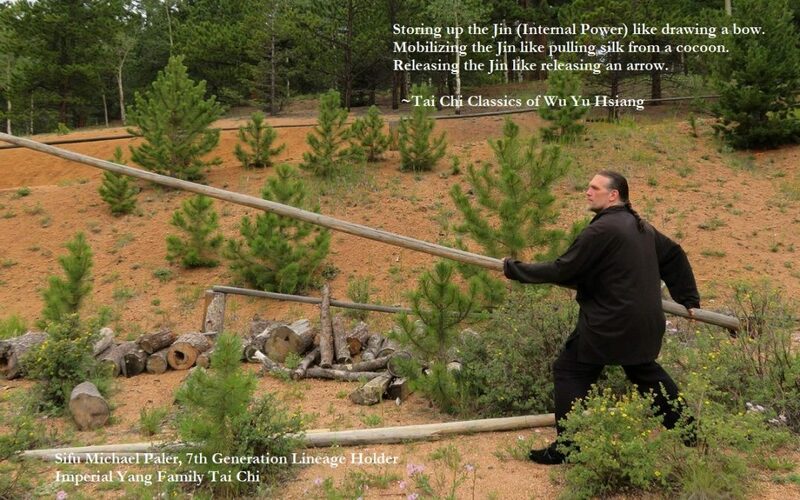 A good example of this is: In Yang Family Tai Chi, silk pulling (“silk” meaning fascia) is a signature method and skill of Yang Lu Chan and the Yang Family Elders, much the same as silk reeling is a Chen style signature method and skill. Another example would be a baseball pitcher, who throws the ball overhand thousands of times. This would be similar but different to another pitcher who throws underhand for the same sport. Each movement and intent develops the body differently. And such is the case in many exercises. Without proper instruction and understanding, one can develop the body incorrectly. Developing whole body fascial lines -v- isolating muscle alone: By developing the fascia you work everything in the body that the fascia encompasses, including the muscles. Exercising in this way, we do not create stress and tension while in movement like a person does when they only engage muscle groups. There’s NO contracting, No impacting, and No stress — because in Tai Chi we do not hold a stretch, rather we “fang song,” we it let go. Tai Chi is the art of letting go, and the result is soft, springy elastic power, like we experienced in our youth in abundance. By practicing in this way, you will train yourself to relax while in movement and also in stillness, and not just in the mind, but in the whole body. You do not have to work just fascia or muscle; you can work all of it at the same time using these Tai Chi principles and methods. Mind/Body Targeting: In this mind/body practice you learn to feel inside your body. You’ll begin to map out where each and every organ, nerve, muscle, and tendon is located, and, in time, you will know how to gently massage, or relax and release, them through targeted conscious movement. You will learn how to regulate the movement of bodily fluids, allowing you to do such things as manually lower your blood pressure when needed, and to release tissues and muscles that are tight and painful. This allows you to take control of your own body and regain your power, for this is your intrinsic right. Being able to Song, San Tong, Kong — “let go” and relax, connect and empty — is a Gongfu (a learned skill) of its own. And as our physical bodies experience “the art of letting go” physically, then our spirit, heart, and mind will have a clear path to follow. This is the work, but if we eat the bitter and do the work, we will taste the sweet. On a personal note: I chose Tai Chi because not only did the methods I am sharing with you help me to be stronger than ever before, but they also helped me to achieve many other life goals I had, such as sharpening my mind, and healing my body from past injuries. My husbands constant encouragement to keep going even when I felt the training was tough, and his willingness to always practice with me helped a lot too. Finding a good training partner is everything. What is fascia? This somewhat trendy word is being used more and more by many in the health and fitness industry lately. Fascia is made up of fibrous tissue that contains very closely packed bundles of collagen, like a thin membrane that connects everything within the body, a continuous web of hollow, fluid filled strands. It’s the body’s natural shock absorber, a spring of energy that surrounds and infuses every structure in the body. 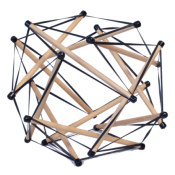 These elastic tissues work much like a tensegrity balls rubber bands (shown in the illustration to the left). They connect the wood pieces together in such a way that the pieces of wood (bones) never touch each other which would create unwanted compression. In much the same way, fascia in the human body creates a matrix of elastic bands for our bones to float in, protecting each and every part of the body individually from impact. This self-aware matrix of elastic bands relays information to the brain faster than our nerve impulses. Neuroscientists now believe it is this amazing structure that carries our consciousness, much like a spider web that encapsulates every nerve, blood vessel, organ, muscle, bone, brain etc… And just like fiber optics, fascia carries and relays information from one part of the body to another as well! Where should I go to learn Authentic Tai Chi Chuan? 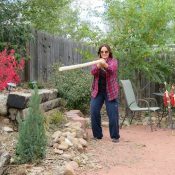 This is what I can tell you from experience: A great Tai Chi Master/Teacher who understands and teaches all the things I have written about in this blog, is a rare find indeed; it’s like finding a pearl hidden in a field. First of all, seek out a teacher with authentic credentials and/or certification from a reputable source. This teacher needs to be able to instruct you in all the Tai Chi principles that are contained within the forms, because the Tai Chi form without the principles is empty and powerless for health or for self-defense. Never think that just because a Tai Chi instructor works at a familiar local community organization that that instructor understands and can teach all these things. Unfortunately, there is not really a standard that companies or gyms use; and, in their defense, they really don’t even know what questions they should be asking new teachers. Some places do require a Tai Chi certification, but never really check into the background of where and who gave the certification or even how long it took to acquire. So, do your homework and be cautious. Also, you should never make your decision based on how it might be cheaper or a better deal financially for you. REAL TAI CHI is worth the investment in your health. Always look for a teacher who possesses in their body the qualities you want to achieve in your own body. Remember: a teacher cannot give you what they do not possess themselves. That said, there really are some amazing instructors out there; you just need to find them. If you cannot find a credible Tai Chi instructor in your area, we would encourage you to sign up for our Tai Chi Online Course. Note: All the teaching and advanced training information offered in this blog was gathered by attending regular Tai Chi classes offered by Sifu Michael Paler! 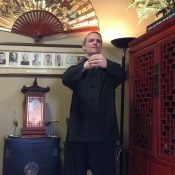 Sifu Michael Paler also travels and offers workshops upon request. Thanks. I love my body than wealth-when everybody run after wealth-then i keep my body well.I regular practise Yoga, Kung fu, Martial arts, taekwondu, breathing exercise. I nvr use any drug/hate disease/avoid doctor. Be active and kick the disease.U hv vast wealth but u r living on disease- no money will give u btr life.I m personally very honest/good health. This is my 2 virtue.STRENGTH IS LIFE/WEAK IS DEATH.